that was produced for the reunion. Paul was born on March 10, 1908 to Genobia Ann (Ward) and Albert E. Douthitt in Bluejacket, OK. His mother was of Cherokee heritage. She was on the Cherokee rolls and received parcels of land when the Cherokees were given allotments. He graduated from Miami High School in 1925. He attended NEO. He had an instructor there who encouraged him to major in geology at NEO. But that was not to be, for which countless young people shall be forever grateful. Billy was born on April 4, 1912 in Claremore. OK. Her parents were Mary Opal (Hillhouse) of Irish descent from Missouri and William Wirt Kerr, from the Indian Territory who was of Scots-Irish and Cherokee descent. She started school in Hockerville, near Picher. She lived in Chelsea and Adair before returning to Picher where she graduated in 1928 at the age of 16 years and 2 months. Billy went to Northeastern State Teacher's College for two years and came back to Picher to begin teaching. She taught at Central Elementary School, the third grade. Some of her students were 14 years old. She said she ran every step of the way home every day after school. She continued her education during the summers, graduating in July 1933 She moved to Picher-Cardin Jr.-Sr. High School to teach music and dramatics. 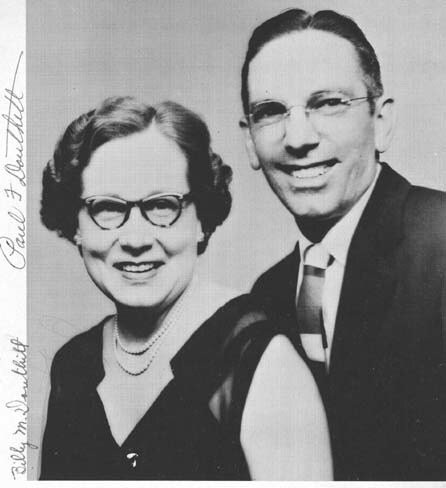 After their marriage Paul began teaching about 1935. He taught at Mineral Heights Elementary School before moving to Picher Cardin Jr.-Sr. High School. He too, attended Northeastern State Teacher's College during the summer terms, graduating in 1941. There were two children born to this couple. Mary Ann, born February 21, 1936 and Jon David, born October 22.1937. Billy took a year off from teaching when each child was born. The family lived in Picher, moving north of Cardin about 1942. Some summers Paul drove a truck for two shifts daily. Some summers he ran a sports program for the boys in the town. He began coaching and, of course, at that time coached every sport, year round. Billy taught for 40 years, Paul taught for 35 years, all at Picher except three years at Davenport, OK from September-1948 through May, 1951. They shared teaching 7th and 8th grades; Paul was the coach and Jr. High Principal. At Davenport, in the building that housed the 1st through the 8th grades; there was a room for a library, but no books. Billy radically changed that during their three years there. When they moved back to Picher, Paul no longer coached, but added Driver’s Education to his class load. During those years Paul taught elementary school, Jr. High Math, Driver's Ed. Coached all sports, kept activity books for the high school, drove a school bus for activities, had a Driver's Ed team that went to contests, and swept the floor of the gym after basketball practice. Billy taught elementary school, High School english, girls' gym, glee club, speech – taking groups to contest in music and speech-and last but not least was the librarian for several years of her career. She had gone to school at OSU in the summer to get a library certificate. Paul retired in 1970 or 1971 Billy retired in 1972. They lived in Miami several years. Paul died in 1984 from heart complications following surgery Billy lives, at the age of 90, alone in Broken Arrow, near her daughter. She still cares for herself, drives, attends church, makes cookies, and continues to love and teach the children (and adults) in her sphere of activity. We lost Billy on December 1, 2006.